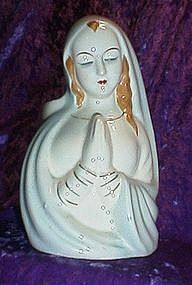 This is a gorgeous Madonna/Virgin Mary in Prayer planter. Stands just over 7" tall. No marks but probably made in Japan. She has some light crazing, 2 air bubbles from the glazing process and a hairline fracture on the rear planter. The fracture does go all the way thru but not around. Can barely feel it with your finger nail. 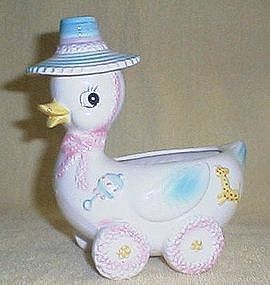 Vintage Duckling on Wheels, smart blue hat, gas giraffe and baby rattle decoration. 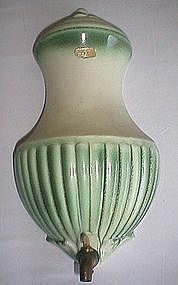 This piece is numbered C-7245 on the bottom, may be Inarco. Excellent condition, has a brown stain on the inside in the chest of the duck, may be old glue from days gone by. Stands 7" x 6 1/2 long. Gorgeous. 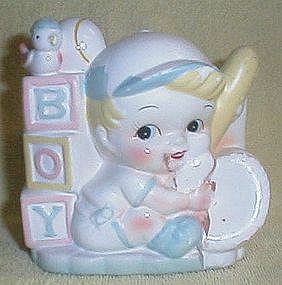 Rubens Baby Boy Planter. He has some paint damage which is easily repairable, the redish color by his lips is paint from the ball glove in his hands. No other damage. Pristine R/B Planter, spells out BABY, little teddybear, kitten and bunny peeking out of the letters. 2 small flea bites and a small manufacturer flaw on top of the Y. 3" x 3 1/2 x 8" long. 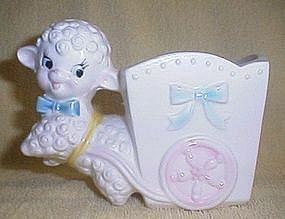 Rubens Lamb and Cart baby planter, has one small chip on the inside of the rim. About 4 1/2" tall, 6"wide. Very cute! 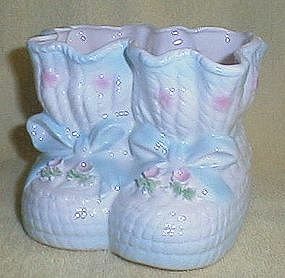 Relpo Baby Booties Planter, small pink flowers and greenery with blue bows. Has a couple very small flea bites. About 5 1/2" wide, 4 1/2" tall. 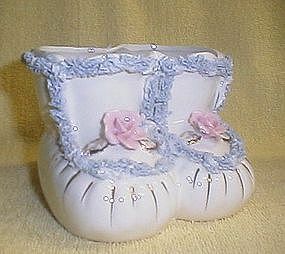 Relpo Baby Booties, trimmed with blue, pind roses, leaves trimmed in gold. Excellent condition. 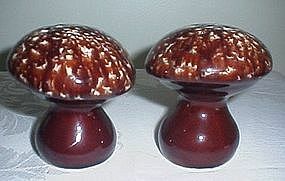 About 3 1/2" tall, 5 3/4" wide. 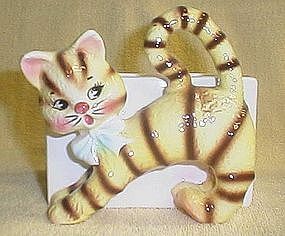 Relpo Yellow Cat with Brown Stripes planter, marked on bottom Relpo 379A. Fantastic condition! 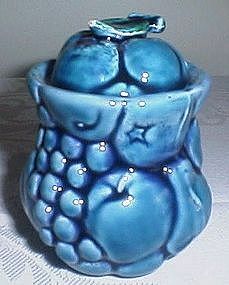 Majolica style blue fruit sugar bowl, about 4 1/2" tall. Small chip on top leaf of lid, one on side of lid. 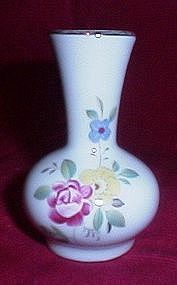 Not marked but may be Inarco. Cute piece! 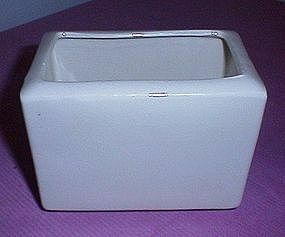 A great Robinson Ransbottom ivory planter. Clearly marked on the bottom. 4 1/4 x 5 1/2 x 3 1/2. There are a few manufacturer blemishes and a tiny flea bite on the outside, some small bites on the bottom rim. 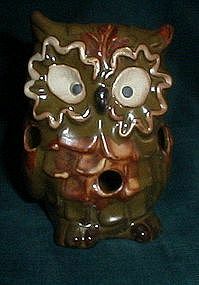 Enesco Owl Tea Light, olive green and brown with cream colors make this guy quite adorable with his big eyes! 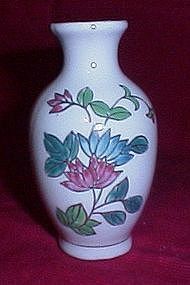 Great condition, he stands about 5 1/2 inches tall. 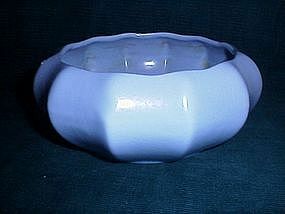 Haeger Stoneware Bulb Bowl, powder blue. Excellent condition. About 3 inches high by 7 in diameter. 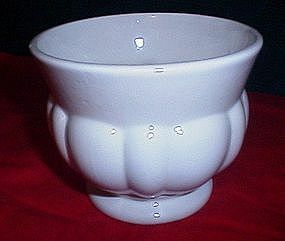 Lane and Co of Van Nuys Cal., divided serving bowl. 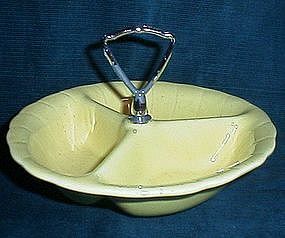 Bowl is in excellent condition, the handle has some of the paint flaking off as seen in the photo. About 8 inches in diameter and 2 inches high.